Trophies are given for many different reasons. There is no right or wrong way to have them engraved, but there are guidelines that will help you write the best trophy engraving possible. Some features should always appear on trophies, but others, such as the message, are left up to interpretation depending on the award. 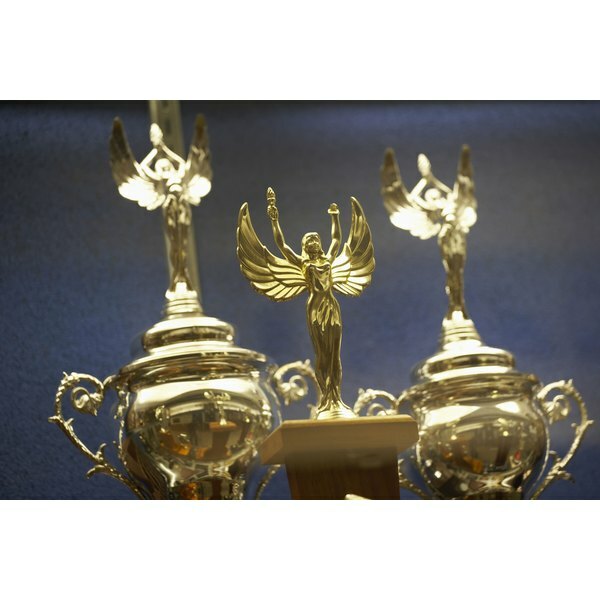 Most trophies should have the recipient's name and the date the award is given on them. However, the name on the trophy can vary depending on the occasion it is given for. At a business meeting and for office awards, put the name that a person goes by around the office. For example, if a person's name is Robert, but he goes by Bob, you should put Bob on the trophy. If it is for a fun occasion between friends or a sports team, you can put a nickname on the trophy. For example, if someone's name is Jane Jones, but her nickname on the team is “the Jet,” you can put the name as Jane “the Jet” Jones on the trophy. The message can be as generic or as personal as you like. If you are struggling for a message to put on it, then refer to what the requirements are for the award. For example, if the award is for community service, and the requirements are to help and serve the community, then write “For excellent service to the community.” Trophies do not have much room to write messages, so make the most of the room that you have and keep the message simple.